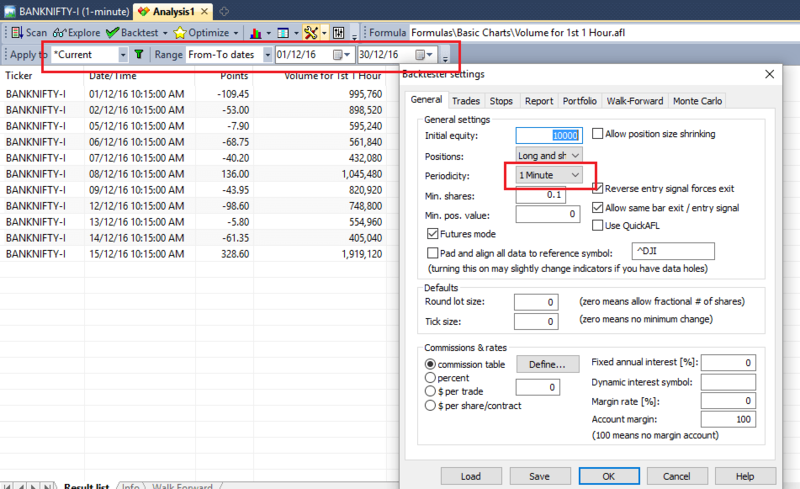 Here is the simple prototype for finding first 1 hour cumulative volume for a given script. This helps one to visualize how the volume in the first 1 hour compare to previous trading days. It is recommended to explore with 1min timeframe as the code is designed to work on lower timeframes rather than higher timeframes like Daily, Weekly , Monthly. Here is the sample exploration output showing that 1st hour volumes are higher in Bank Nifty futures on 15th December 2016 (Post FED Rate hike) reminding that participation activity is high in the first 1 hour. It also provides information on returns it made since the market open in terms of points. High Volume with a trend Indicates that high supply or demand in those zone. However extreme volumes compared to the previous sessions indicates that possibly trend is likely to be exhausted. And in contrast lower volume indicates lower interest from the market participants i.e lower supply or demand in those zone in the first 1 hour. NMA Swing Explorer I had added few more codes to the NMA Buy or Sell Signal to make it exploration possible. The purpose of the Exploration is to identify the stop loss of any kind of trade at the given time. The code is just a prototype you can bend as you want! I am a small Trader come investor. I retired Business men due to Physical problem. I am using amibroker since long time. Request your help for a scanner that scan’s scripts that have X1 or above volume when compared with previous session and the script has gained 1% or more when compared to previous day. Hope and awaiting your cooperation. Thanks for your very good site. tom gentile developed money calander for us stocks. i saw a friend trying to make afl similar to that but he failed. please make amibroker afl intraday scanner for bellow condition . this will help us more , sir please .